On June 3rd we had another set of figures which although fake, still shocked the financial world. Non-farm payroll increased by only 38,000, massively lower than any forecast. But add to that 244,000 fictitious jobs created and 484,000 workers which were forced to go from full time to part time work, then we get to a reduction in full time jobs of 690,000! Also, the workforce has grown by 21 million since 2007 but the actual number of employed has grown by only 5 million and out of those only 2 million are full time workers. And the quality of the jobs is also declining dramatically. Since 2007 1.5 million manufacturing jobs have been lost whilst 1.5 million hospitality workers (waiters, restaurant workers etc) have been added. But still, because of the idiocy of how the figures are calculated, the unemployment rate went down from 5% to 4.7%. The fact that people capable of working are leaving the labour force in droves is totally ignored. 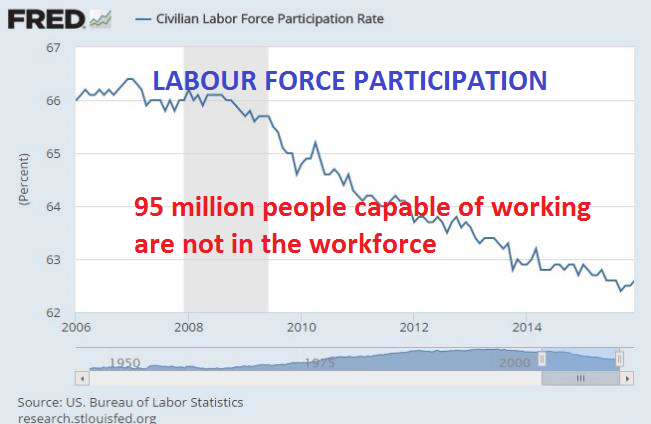 There are now 95 million Americans capable of working who cannot find a job. And for the ones who have a job, average wages have declined since the 1970s. The real unemployment rate is of course nowhere near 4.7% but instead 23%. These statistics certainly don’t point to an economy which is booming. And still the whole world focuses on monthly, manipulated figures such as unemployment. The US economy, as well as many other nations’, is bankrupt and has only got a temporary stay of execution due to massive money printing and zero or negative interest rates. US federal debt has more than doubled since the crisis started in 2007. 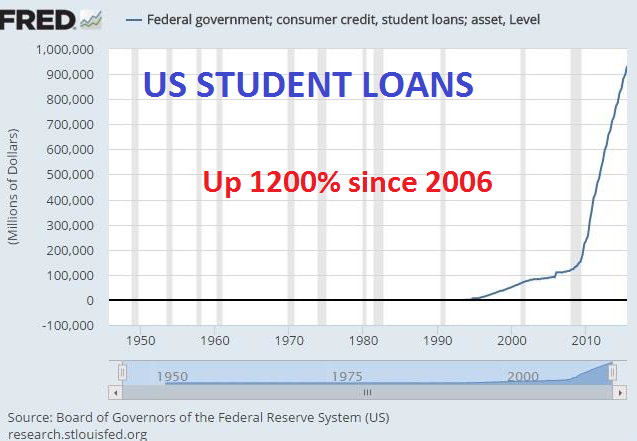 Student and auto loans have grown exponentially and are both now above $1 trillion. Corporate profits are falling and most economic statistics are in a downtrend including housing and retail sales. Market observers are totally ignoring the real figures and the long term trends and are instead focusing on what the Fed will do. Most people don’t realise that the Fed can only fool the world for so long. The rate hike in December was totally against economic trends in the US and even more so against the international economic and monetary trends. As more and more countries have gone to negative rates, it is totally indefensible for the Fed to believe that they can raise rates. There are now $10 trillion of global government debt with negative yield. As I said back in December, the rate hike then was an anomaly and I do not believe that the Fed can increase rates in the next few months or even this year. World markets are focusing on short term indicators and actions and totally ignoring the desperate situation that the world economy is in. Global debt has grown by over 60% since the crisis started in 2007 and is likely to accelerate at a much faster rate in coming years. 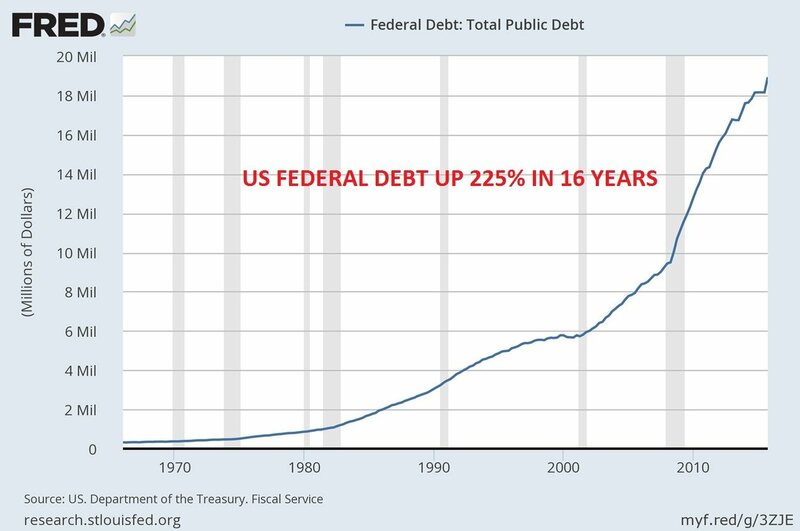 Just take US federal debt which is forecast to grow from $19 trillion to $25 trillion in the next nine years. But that is the optimistic forecast and debt could easily increase to $35 trillion. And if the banking crisis flares up again, including a derivatives failure, we could easily be looking at money printing in the hundreds of trillion dollars. I know that all of this sounds like scaremongering but we must remember that virtually no one believed that the subprime housing crisis would develop to a disaster that almost brought the financial system down. Since none of the problems have been resolved since then, we are only looking at a temporary postponement which will eventually lead to a crisis that governments and central banks are unlikely to solve next time around. Last time it was mainly a US and a European problem. But this time around the problem is not only in these two areas but also in Japan, China and Emerging Markets. In an interconnected world, the crisis will spread like wildfire and there will be nowhere to hide. Coming back to the poor US unemployment figures, they are not the reason for a change in the world economic outlook. The die was cast many years ago and the world is now going through a gruelling process which can only have one outcome. For the world economy to embark upon a continued long term growth path, the unsustainable global debt must first implode. That will of course include an equivalent fall in asset prices such as stocks, bonds and property. The financial system is unlikely to survive this process intact. But before that we are likely to have a brief hyper-inflationary period as Central Banks desperately try to save the financial system with massive money printing. When we consider the size of the global bubble, we should not really worry about short term timing since the key is to protect your assets rather to try to guess when it will all unravel. Any short term event could trigger the inevitable. We recently had the Fed interest decision which as I forecast did not change. Then we have the Brexit vote on the 23rd. The latter could have major repercussions for the very fragile European economy but it now seems that the Elite has managed to scare the Brits to such an extent that they are likely to stay in the EU. In spite of that we are now seeing the beginning of the end of the failed European Super State. Gold and silver are of course the ultimate wealth preservation asset. The correction since the 2011 top ended in December 2015 and we have seen a strong upmove to $1,300 and a subsequent retracement to $1,200. It now looks as if the long term trend has resumed and I would not be surprised to see new highs in both gold and silver in 2016. For anyone not invested (or underinvested) in precious metals there is now an urgency to protect assets by buying gold and some silver. The expected major price move is not the main reason for this urgency. The main purpose is to own “insurance” in the form of gold and silver in order to be protected against economic and financial risk which has never been greater in world history.